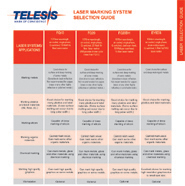 Choose from a variety of options to enhance your Telesis Marking System. All are tested for compatibility and carry a one-year limited warranty. Ask your Telesis Sales Representative about the options best suited for your application. TELESIS offers expert integration of our entire range of pin marking systems, including software, hardware and control system design services. Whether it’s a stand-alone manual marking station or a fully automated on-line factory-integrated application, TELESIS can provide a complete solution to your marking system requirements. Protect control components from harsh environments. Several wall and floor-mount styles/colors available. Custom laser carts & enclosures. For flexible, virtually weighless, hand-held marking. Increase production and avoid errors with quick verification of downloaded messages. With manual, pneumatic or stepper motor-driven head positioning mechanisms.